Two new analyses of fossil remains from the recently discovered human relative suggest the species may have been uniquely adapted to both terrestrial and arboreal locomotion. The Homo naledi hand and foot were uniquely adapted for both tree climbing and walking upright.IMAGE, PETER SCHMID AND WILLIAM HARCOURT-SMITH | WITS UNIVERSITYHomo naledi may have been just as adept at swinging through the tree tops as striding across the ground, according to two new studies of fossil remains from the recently discovered human relative. Reporting their results in Nature Communications today (October 6), two international teams studied a H. naledi fossil hand and foot recovered from the cave 50 kilometers northwest of Johannesburg, where scientists unearthed the remains of 15 individuals belonging to the new species in 2013. 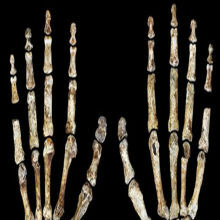 The teams found that H. naledi’s hands had the wrist morphology and the long, robust thumbs common to Neanderthals and modern humans, while the human ancestor had longer, more curved fingers, typical of primates that swing and hang from tree branches or rocks. 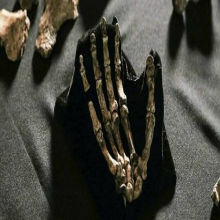 The species’ feet, however, had a predominantly modern human-like structure, suggesting that H. naledi was also bipedal. 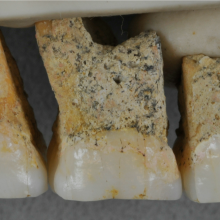 As the fossil-rich South African cave continues to give up its secrets to busy paleoanthropologists, a more complete picture will emerge of our 4 million-year-old relative will emerge. 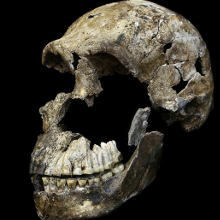 For now, it’s becoming clear that H. naledi was by no means a one-dimensional hominin. “Regardless of age, this species is going to cause a paradigm shift in the way we think about human evolution, not only in the behavioral implications—which are fascinating—but in morphological and anatomical terms,” Harcourt-Smith said in a statement.